Do you want to write like Stephen King, J.D. Salinger or even Vladimir Nabokov? Well, there we can’t help you. But if what you want is great quality content that draws readers who are potential leads, we have a checklist that will help you make your company blog more popular. It was created with our own time, blood and sweat. Now we want to share it with you. Use it to check what your company’s writers are producing to find out if you’re doing everything possible to produce content that attracts hundreds of leads. In a past article, we talked about how we came up with the checklist for creating article outlines. What started out as a small set of rules has grown into a longer checklist that became a vital part of our work process. The same thing happened with our checklist for writing articles. The rules evolved and grew into a full-fledged checklist because, without a certain standard, articles can greatly vary in quality. The checklist helps us ensure that all articles in the blog comply with company standards and helps us avoid typical mistakes. Here it is, our bragging right! Also, a close writers’ self-check reduces the amount of time our editors have to spend on editing each piece. Let’s look through all the checklist points, one by one. This helps our editor and designer quickly access the correct file. This point may seem like a trifle, but being consistent saves a lot of time. This makes the article file more convenient for the editor and our clients. During a scheduled call, this makes it easy for the client to tell us which page needs changes. It’s vital to hook the reader and encourage him or her read it. Each of our articles should start with some interesting fact or story. This is one of the most effective ways to attract the attention of the reader and make sure the article will be read. We decided that it would be great to start the article with a real-life situation. It’s important to give your potential reader a motivation for reading further. Tell your reader what he or she will get after reading it. For example, you can suggest that increased profits, saving money, or an influx of customers may flow from following its advice. The main thing is that the reader should get what you promised. Otherwise, you will only undermine the credibility of your blog. This point helps to save our potential readers time; they can quickly go through the article to learn if it’s relevant. 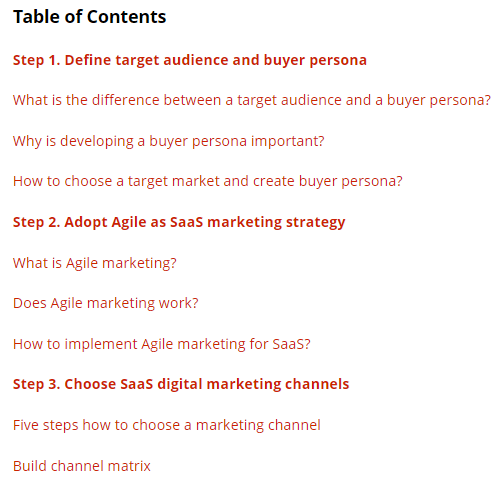 For example, our article “SaaS Marketing Plan: 4,500-Word Guide How to Build It” was so big that we decided to place a table of contents in the introduction. Perhaps the potential reader has already solved the problem that we are describing. In that case, he or she does not need to read this post and can go on to another article. We’ve determined that this length is enough for a good intro. We try not to exceed that number of words to avoid the reader feeling we’re just wasting their time. Keeping chunks of text at approximately equal sizes makes the article more pleasant to read. It’s not as comfortable to read an article in which one paragraph consists of 20 words, and the next 600. Of course, it is not always possible to balance the volume of text in this way, but we at least try. We know how hard it can be to make your way through a solid canvas of text. Shorter paragraphs are a service to your busy readers. For the sake of making the article easy to read, we try not to use complex structures and phrases. After all, we’re not writing literature. This has the side benefit of improving the article’s SEO score. We use WordPress, and it tells us how readable our texts are. The result can be worse if the text consists of complex sentences. This helps save readers’ time and comprehension: they can easily understand the essence of the article by glancing at the subheadings. For example, in the article you can see by clicking here, all the subheadings look like questions. We should always support statements with evidence—quotations, statistics or examples—so that readers know they can trust our words. We try to ensure that everything in the article is clear and simple. There’s no good reason to turn the text into a heap of complex and vague phrases. This is related to Point #12: Just don’t repeat the same thought. This is a simple text check for grammatical errors. To save the editor unnecessary work, our writers check the texts themselves before handing them over for editing. It’s hard for online readers to read a whole page of nothing but text. Therefore, make sure your text is illustrated. A CTA (Call-to-Action) button will help convert readers into leads. No matter how good your texts are, if they don’t convert, they are almost useless. We try to place the CTA at the beginning of the article and adapt it to the article topic. This helps previous blog articles get more views. We place links within the text of the new article in meaningful places. This makes it easier for the reader to perceive that the quote is direct speech. Words in quotes can also serve as illustrations, visually breaking the text into blocks. We make the text contain fewer words without any value. As you know, if text can be removed without any loss to meaning, it is best removed. This isn’t the time to confuse readers with new information. The conclusion should be a summary of what’s already been said. It’s better to put all useful information into the main parts of the article. This allows us to ensure the text of the article is unique. If some phrases repeat, this can affect the SEO score of the article. So, if you want your article to rise higher in Google search, make sure there are no repetitions in the text. The author’s thoughts should be brief and clear. Make sure there is no unnecessary text in the conclusion. As in the case with the intro, it’s important to encourage the reader to read the conclusion. The fact is that many visitors to the article page do not read the text itself. Visitors read the intro and, if interested, read the conclusion of the post. Only then might they go to the main text of the article. So, our goal with the conclusion is to encourage the visitor to read all of the text, and making sure it’s written in lively and simple language will help. Maybe it’s about the habits of a university education, but we found many of our writers finishing articles as though they were scientific essays. “In this article, we’ve discussed the following points…” was a typical phrase. This point reminds writers that they are not doing a lecture but writing for a living business environment. We try to encourage readers to discuss our article and attract new readers. The article should be finished with a simple and, at the same time, interesting question. It is important to formulate a question that can’t be answered with a simple “yes” or “no.” Otherwise, you won’t get the discussion you are hoping for in the comments. It is important to make subheadings noticeable and help them stand out in the middle of the text. To help the reader notice them, we put subheadings in title case, using capitals. First, if your article is not unique enough, you can be accused of plagiarism. No kidding! This can lead to the collapse of your whole business. Second, high text uniqueness improves your article’s SEO score. Hemingway is a tool that helps us make the articles more readable. 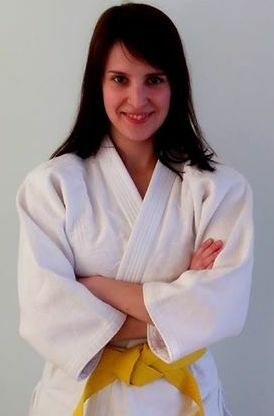 The program is free and very user-friendly. The system will tell you which sentences in the text are too complex, so you can simplify them. The main rule is to try to make the rating of the text as low as possible. The mark 8 is enough. 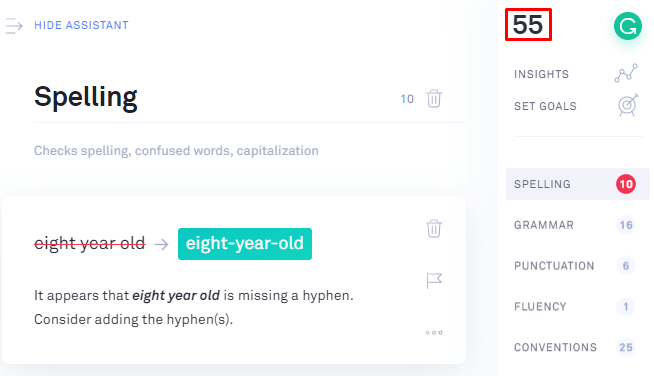 Grammarly is an app that helps us reduce errors in the articles. The program works on the basis of Artificial Intelligence, which finds stylistic, spelling, grammatical and punctuation mistakes in the text. The more mistakes you fix, the higher your rating becomes. We try to ensure the rating is not less than 90 percent. 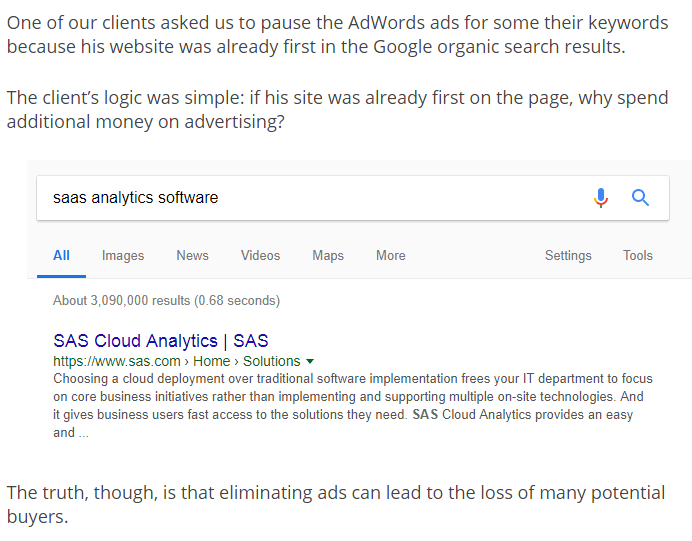 How can you encourage people to read articles in your company blog and convert those readers into leads? One of the big components of success is to ensure that all your articles reach a certain quality bar. 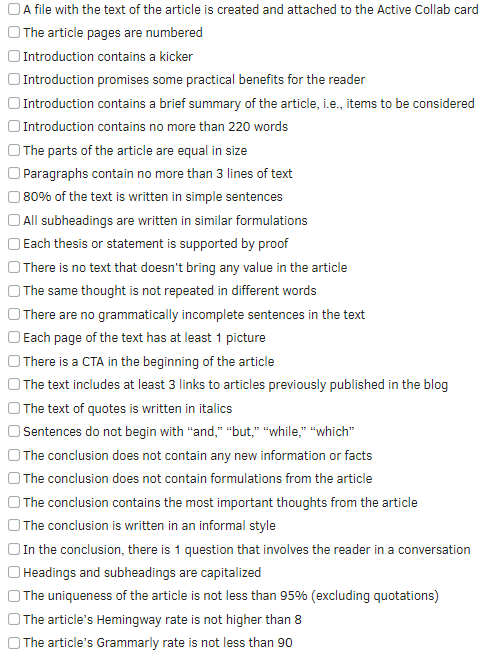 Try using this checklist to assess the articles in your company blog. This will help you understand how to improve the quality of texts and make them more attractive to potential leads. Maybe there aren’t enough CTA buttons in your articles? Or maybe you don’t encourage readers to start discussions? What did you discover about your blogs?